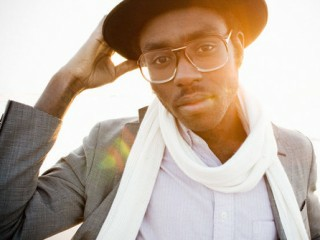 Devonté Hynes, better known as Lightspeed Champion or Blood Orange, is a composer, songwriter, producer and author, who has written for artists such as Florence and the Machine, Diana Vickers and The Chemical Brothers on their 2007 Grammy award winning album We Are The Night. He is currently signed to Domino Records. In early 2007, Hynes recorded his debut album in Omaha, Nebraska with Saddle Creek producer Mike Mogis, most famous for his involvement with the band Bright Eyes. A number of Omaha-based musicians appear on the record, including Mogis himself, trumpet player and pianist Nate Walcott (also of Bright Eyes), The Faint's drummer Clark Baechle and guest vocalist Emmy The Great - along with moonlighting members of Cursive and Tilly And The Wall. These recording sessions resulted in the single "Galaxy of the Lost", released on July 30, 2007, and the album Falling off the Lavender Bridge, released on January 21, 2008.Hynes has also recorded a number of bootlegs and unofficial releases, made available to the public through his blog and MySpace. These include an album written and recorded entirely in a day and an EP consisting only of covers of Green Day songs. Hynes has also written and contributed songs to a number of other acts. His arrangements and vocals have appeared on songs by The Chemical Brothers ("All Rights Reversed", from 2007's Grammy award winning album We Are The Night which entered the UK Albums Chart at #1), Basement Jaxx (on their album Scars), as well as Florence and the Machine for her #1 album Lungs and Solange Knowles. He has co-written and produced songs for Diana Vickers. on Songs from the Tainted Cherry Tree which debuted at #1 on the UK Albums Chart. He has also produced and written songs for the forthcoming Theophilus London album including the Lovers Holiday e.p.Hynes also has contributed music to the film MacGruber, released summer 2010, including the duet "Rock My Body" with SNL cast member Kristen Wiig.In late 2011 he produced Australian noise pop duo Bleeding Knees Club's debut album Nothing To Do, which was released March 2, 2012.He is currently in the studio working on the new Solange Knowles album. In December 2008, Hynes was asked on behalf of The British Film Institute to perform the Soundtrack of the cult Hal Ashby film Harold And Maude after a screening of the performance. Hynes then had to cancel this due to an operation he had to undergo on his throat. The event was rescheduled for May 2009. In July 2009 Hynes will reprise the soundtrack and perform at Latitude Festival. In June 2009 Hynes performed at The Barbican in London in commemoration of the composer Moondog. Singing renditions along with London Saxophonic of songs from the Moondog Album "Sax Pax For A Sax". He also sung "Fujiyama part 2" backed by The Britten Sinfonia conducted by André De Ridder and Andi Toma (Mouse On Mars). In April 2010 Hynes returned to The Barbican to perform with The Triffids for a special concert in honor of their singer Dave McComb along with Warren Ellis, Tindersticks and members of The Brian Jonestown Massacre. In March 2008 Hynes self-published a small comic book titled I'm Asleep - Comics, Photographs and Illustrations to mark the release of Falling off the Lavender Bridge. It featured comics by himself, Ferry Gouw, Faris Badwan of The Horrors and Gary Card, and photography by Hynes. June 2009 saw the release of the book Punk Fiction: An Anthology of Short Stories Inspired by Punk, which featured a short story by Hynes titled "The KKK Took My Baby Away..." (from the Ramones song of the same name), described as a "comedy sci-fi monologue". Proceeds from the book went to the Teenage Cancer Trust. View the full website biography of Lightspeed Champion.